Financial statement analysis refers to the process which involves the identification of the financial strengths and weaknesses of a certain business organization through the proper establishment of relationship between all the items present in the balance sheet, income statement and any other financial statement or financial report. Various techniques and methods are now used by financial statement analysis experts and these include common size percentages, ratio analysis, trend analysis, funds analysis, schedule of working capital changes and comparative financial statements and reports. The reason why financial statements are analyzed is the fact that all the accounts and figures in these statements are useful for sound decision-making purposes. These financial statements are prepared as a means of meeting the external reporting obligations of an organization. They play a very vital role when it comes to establishing a framework needed in formulating managerial decisions. However, all the information presented in the financial reports and statements are deemed useless if the people within the organization do not draw meaningful conclusions out of these. This is the main reason why finance and accounting experts especially those whose focus is on analyzing financial statements are essential in the success of a business. These experts can help analyze and interpret all financial statement and data and this will be a huge help in finally making decisions. Learning all the basic concepts and strategies associated to effective financial statement analysis is not that hard if you take part in the financial statement analysis certification program which is now introduced by Brainmeasures to the public. Brainmeasures, an online certification company, has been in the industry for quite some time now and it continues to provide individuals and professionals who are willing to learn something new and improve their skills on their chosen craft and field with the right information. This is also the case for the Brainmeasures financial statement analysis course. 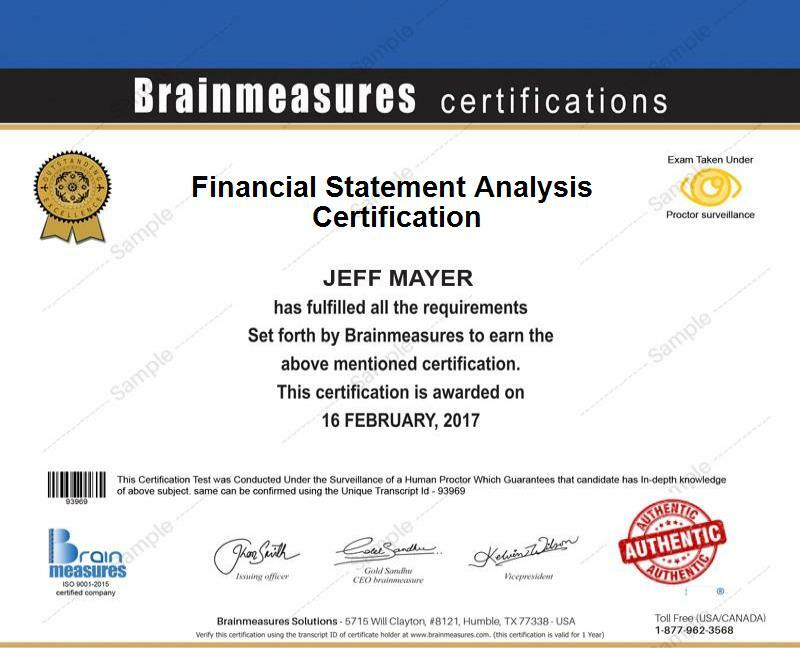 The financial statement analysis certification course offered by Brainmeasures is guaranteed to hone your skills in the field and provide you with a higher level of knowledge necessary in ensuring that you are able to perform all your tasks and responsibilities efficiently once you get hired for any position related to the field. A hard copy certificate in financial statement analysis will also be given to you at the end of the program and this will allow you to start practicing your career. The financial statement analysis certification program which is now among the many reliable programs offered by Brainmeasures aims to help individuals and professionals in the field master all the strategies linked to analyzing financial statement data and the financial performance of an organization. Among the many people who can gain benefits from this certification course are accountants, lawyers, investment advisors, analysts, credit analysts, auditors, compliance staff and any other professional who need to have a strong foundation about the financial statement analysis process and who is responsible in formulating lending and investment decisions. Financial statement analysis certification holders have great earning potentials. As a beginner, you can expect your starting salary to be around $38,000 to $63,000 per year and this is already a pretty good amount. As you gain more experience in the field, your salary can be expected to grow to $85,000 to $139,000 annually.